Off and on, some website management processes do take a lot of our time, which, we could actually spend on improving other aspects of our e-commerce business. 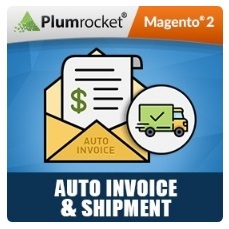 Therefore, in this article, we are going to talk about Plumrocket Auto Invoice & Shipment Magento 2 Extension which is a great assistant in automating some manual processes related to payment transaction processing. 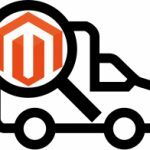 Thus, with the help of this Magento 2 tool, you will be able to automatically send generated shipment and invoices to your customers, once they have made a purchase on your website. 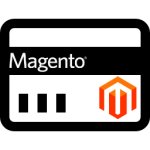 However, we would like to point that this auto generate Magento extension is completely open-source, therefore, it is constantly developing and obtaining new features which are able to make a positive impact on your website. As we have already mentioned, the Magento 2 extension is compatible with other third party modules, therefore, we encourage you to figure out even more opportunities, visiting Best Magento Extensions to Create Custom PDF invoices. 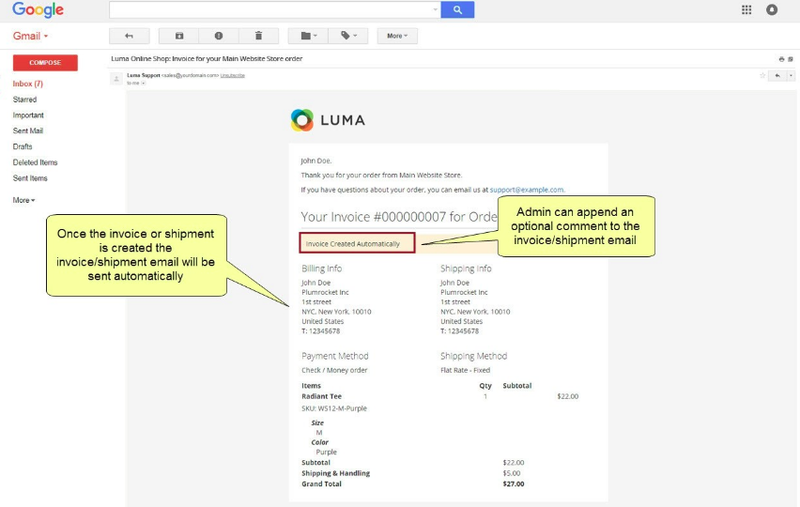 By looking at the picture below, you will be able to understand what invoices and shipments your customers will receive on their email addresses. After extension installation, you are able to customize the functionality of the tool in its general configurations. 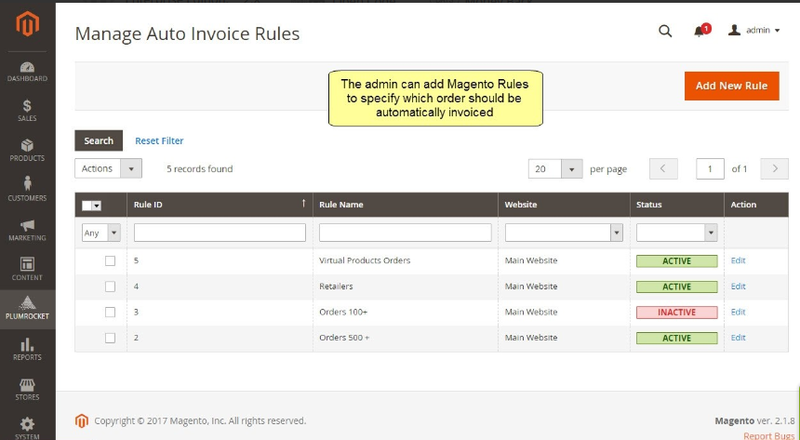 Here, you can enable/disable the Magento 2 instrument and decide whether you want to automatically send invoices as well as shipments. 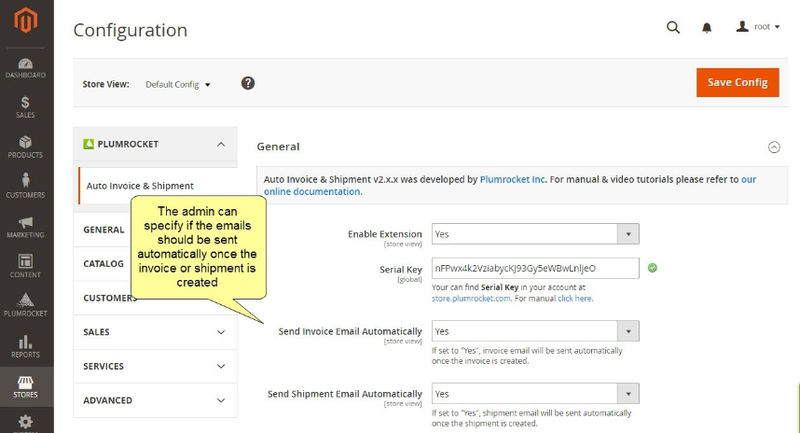 On the screenshot which you can see below, there is a Rules grid with the help of which you are able to automate the sending invoices process. On this grid, you are to specify what conditions are to be met to send invoices in an automatic fashion. To add a new rule, simply click on the “Add New Rule” button. Once you have clicked on a certain rule, you will get to the following page. Here, you are able to edit rule name, its status, the phase at which an invoice is created, specify capture amount as well as choose the store views. Scrolling down a little bit, you will find the Customer Groups field. Apart from it, you can leave a comment to your clients which will be showcased in invoice history. However, you are also able to add the comment to invoice email letters. The last part of this section actually defines which conditions are to be met to automatically send the invoices. 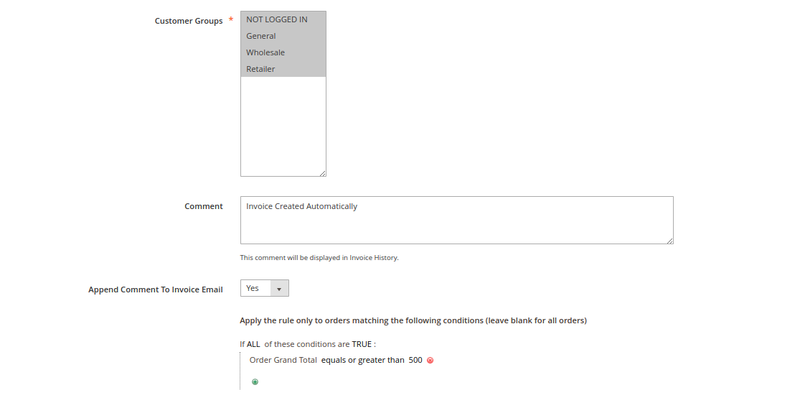 In case, you leave this field blank, the module will consider that invoices should be created for all orders. In order to manage shipments rules, go to the Shipments grid. In fact, it has the same look as the Invoices one. Moreover, once you click on a shipments, you will have to fill in the same fields. In case, you have a bunch of rules, do not get worried for there is a searching system, simply specify what kind of rules you are looking for and the module will automatically sort it. 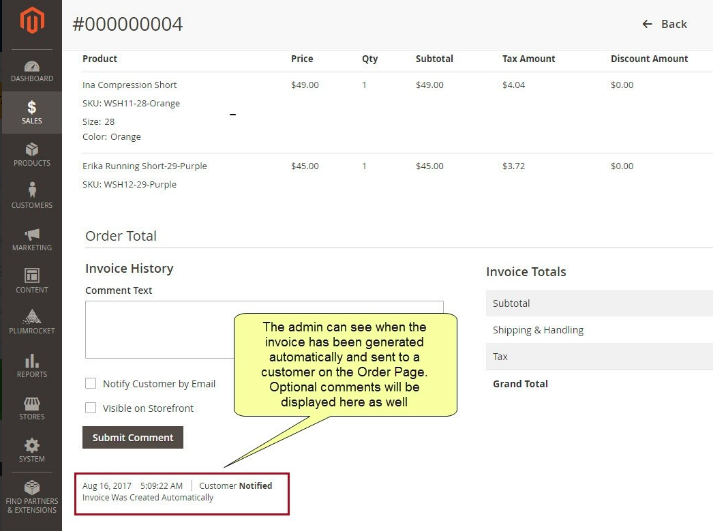 When you go to Sales => Orders you will be able to see the status of invoices and shipments: whether your customers have already been notified or not. Having discussed the Plumrocket Auto Invoice & Shipment Magento 2 Extension, we are able to state that with module assistance, we can significantly optimize website administration processes and provide clients with invoices and shipments without any problem. 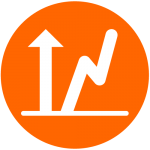 The tool is available for both Magento 1x and Magento 2. The Magento 2 version costs $69.